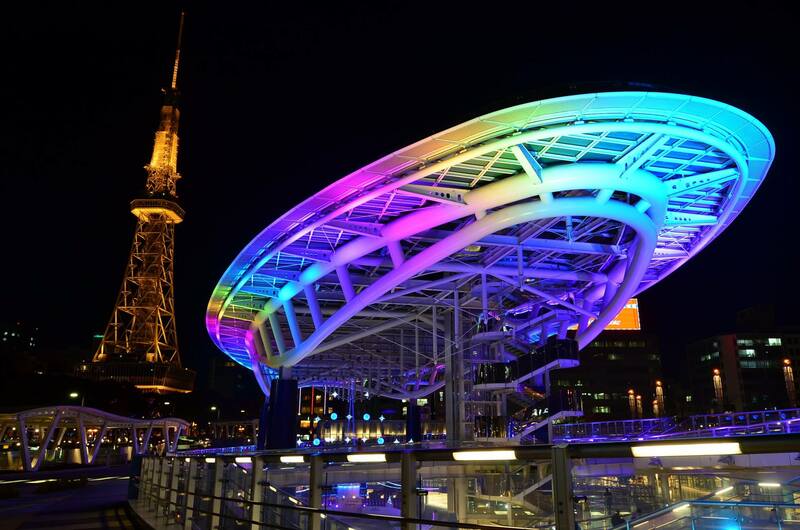 TONN (meaning ‘wave’ in Scottish Gaelic) is a light, sound and poetry installation in the city centre of Nagoya, at the Oasis 21 transport interchange. This multi-media public art piece brings the experience of Scottish waves translated through the movement of light, poetry and sound, to create a performance that injects natural dynamics into this hi-tech urban structure. Created in collaboration with sound artist Lars Koens, poet Olivia Tutton and sound recordist Pete Smith, this performance is realised through collaboration between The Aichi University of the Arts (AUA), Nagoya, and Edinburgh College of Art (ECA), The University of Edinburgh, as a partnership project of Aichi Triennnale 2016 and with support through UNESCO as a cultural exchange between UNESCO Creative Cities for the cities of Nagoya, Japan and Edinburgh, Scotland. 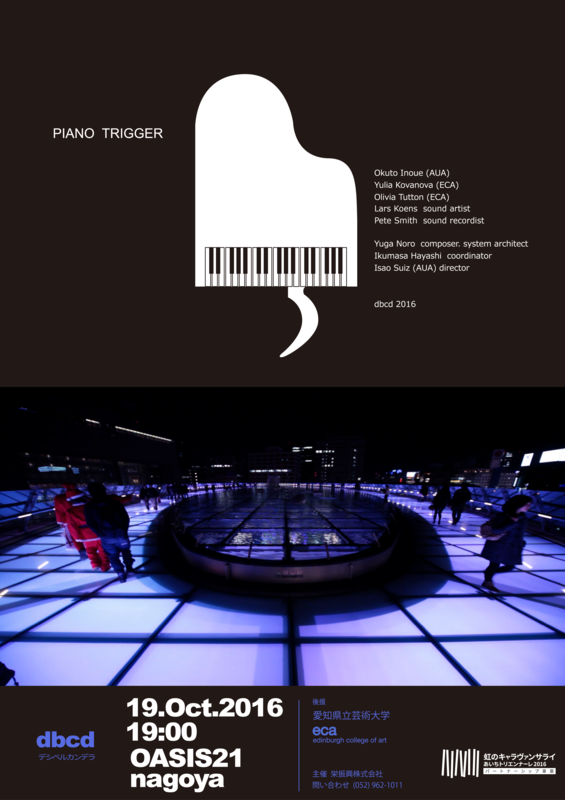 Performed as part of live ‘PIANO TRIGGER’ event, TONN is a public installation where lights of Oasis 21 follow the natural sound waveforms of the Scottish oceanic waves with a poem that is written into the visuals and sound broadcast onto the streets of central Nagoya. The piece is inspired by the movement of oceanic waves. The world’s oceanic body, covering the majority of the Earth’s surface, links the two lands. A ripple on the surface of the ocean is the motion of the entire ocean. Similarly, a wave experienced off the shore of Scotland resonates on the Japanese islands. It might be imperceivable immediately through the limited human senses, yet holds beautifully on the delicate fabric of the planet. 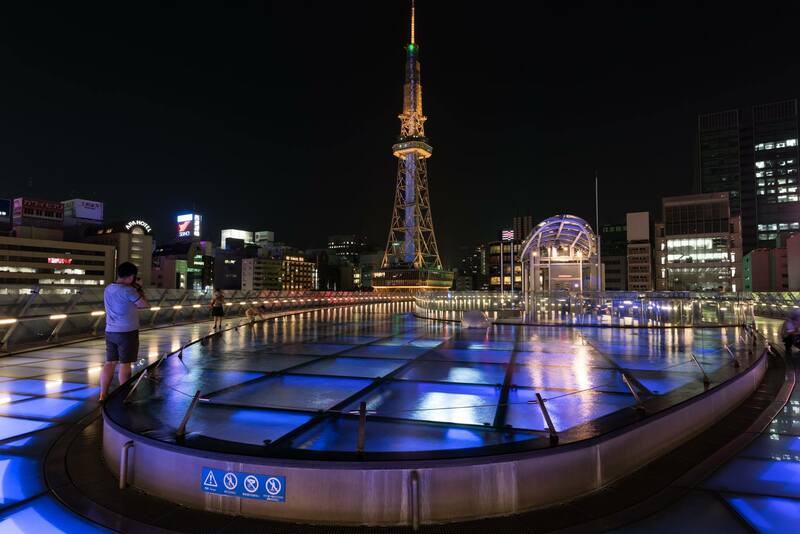 Poem by Olivia Tutton, with translation into Japanese by Kohei Sakamoto and Catriona Anderson, read out and also written into the light system of Oasis 21.